Scientists have found that social networks don't help us copy analytical thought process from our peers. Credit: Steven Parker. In a study published in the Journal of the Royal Society Interface scientists have found that whilst mass connectivity through social media and the internet makes us look smarter it might be making us stupider. Copying other people has helped the human race become adaptable, letting us acquire information from other people as well as by direct experience. In the internet era, where we have access to a diversity of information, many pundits say humankind will learn to make more informed decisions. Whereas others suggest having so much information at our fingertips will limit our ability for concentration, contemplation and reflection. Seeking to find out if social networks make us smarter a team of scientists investigated if networks help us imitate analytical thought processes from our peers. To carry out their experiment the researchers tested university students with a series of brain-straining questions. 100 volunteers were separated into 5 social networks each with 20 individuals. Connections between the people in the networks were assigned randomly by a computer to fit 5 different network patterns. At one extreme all the people in the network were connected directly to all the others, and at the other extreme there were no connections at all. To test how these networks helped the people in them to learn, the scientists quizzed the volunteers with a 'cognitive reflection test', a series of questions which rely on analytical reasoning to overcome incorrect intuition. To see if the social networks helped the people in them to improve their answers the volunteers were asked each of the questions 5 times. The first time the volunteers had to figure it out on their own, the next 5 times they were allowed to copy the answer from their neighbours in the network. The researchers found that in well connected networks volunteers copy-cats got better at giving the right answer the more times they were asked and the more opportunities they had to steal their neighbours' answers. This result showed that when the students had lots of connections to peers they could recognise where they had given a wrong answer and swap it for the right one, proving to the scientists that well-connected networks can help us get the right answer because we can copy from our peers. The scientists compared how well the volunteers faired in the three consecutive questions to see if the volunteers were actually getting better at figuring out the problems themselves or just at copying the right answers. They found that there was no improvement from one question to the next; even when individuals had realised in the first round of questions that finding the solutions required deeper thought, in the next question they were back at square one. 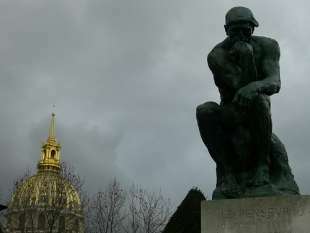 The scientists say it's a surprising result because it's already been proven that analytical reasoning can be primed very simply, by showing subjects a picture of Rodin's Thinker for example, or using a challenging font to type up questions. The team say the results show that whilst social networks helped the volunteers choose better answers they didn't prime them to answer more logically themselves, showing that 'social learning does not seem to help individuals bypass their bias in favour of intuition but rather help society as a whole thrive despite this bias'. Whilst some commentators say the internet is making us stupid and others say it's helping us make more informed decisions the scientists behind this study say that they might both be right. Being able to copy from other people in vast networks means analytical responses rapidly spread, fulfilling their promise of improved decision-making for well-connected people. 'On the other hand, the bias may very well decrease the frequency of analytical reasoning by making it easy and commonplace for people to reach analytical response without engaging analytical processing' say the team, and this tendency to copy without thinking 'can explain why increased connectivity may eventually make us stupid by making us smarter first'. The time you spend on those social media pages can be use to learn a lot of things!! Just look at F_ _ _-book; a platform for mentally incapacitated. After a certain time duration users become even more incapacitated than they were before they started on the platform. There are pros and cons, but as the father of two teenage kids, I can see that while social media may not make anyone stupid, overuse can distort the users' sense of self and not in a good way. The real problem (as I see it) is that whereas a good deal of teenage behaviour in general is transitory, social media use can reinforce bad habits that as a result remain with someone, even if in watered down form, forever. Akin to the multitasking phenomenon, makes one feel smarter while achieving the opposite. For the majority, learning to rely on others to do their thinking. Being nestled deep in a group of friends, like-believers, you can never be wrong, either. For such people, the prospect of losing connectivity must be frightening. It's not an either/or choice. Analytical thinking helps you to design cases which will maximize experience. Only doing trial and error (only relying on experience) gets you nowhere - especially whith issues that become more an more complex. Only relying on analytical thinking also gets you nowhere - as you never get to test your assumptions. Fortunately there are search engines...which help uncover the 'copy/paste geniuses' pretty quickly. @Lex "spell chequers" [sic] HaHa. I think you should consult that nice fat paper dictionary. Social networking is probably indeed making us a bit dumber, at this current stage, but it's probably because we are still at the stage of imagining that a blank text box beneath an article SHOULD make us smarter. If we want to generate intelligence from interaction, we're going to have to create systems which elicit intelligence. It's not going to happen by accident, without any effort or model for how to make it so. Is social networking making us stupid? Yes and no. In the PopSavvy game, 78% of Under-30s said that social media was making us less social. However, if they had asked the same question from a positive perspective, "Is social media making us MORE social? ", the U30's would probably voted YES as well. Social networking isn't inherently good or bad. We make it whatever it is.